We're in the midst of a heat wave here in New England and to be honest, I can't take it. Hot, humid and pregnant just do not go well together. 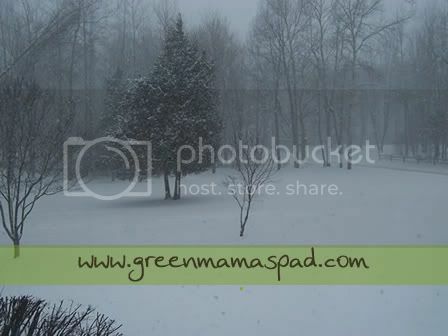 So I dug out a winter photo of our front yard to try and keep my mind off the heat and thinking about cool weather. Snow sounds so good right now! I'm so tired of the heat lately too. Isn't it fall yet? I am so not looking forward to winter...I wish it could stay 85 degrees and beautiful all year long here! But the pic is beautiful! I should note that once winter arrives, I will be complaining about the cold and all the snow. I hate winter, but I also hate 95 degree weather with like 85% humidity. So pretty! I can't wait for winter! Wow. That is SO what I need right now. It is supposed to be nearly 100 tomorrow and I have no A/C. I'm sweating in my kitchen not looking forward to tomorrow. Pregnancy in the summer is the worst! I should know, I had my son mid-August of last year. I was HUGE during the summer months...in LOUISIANA! Yikes! It's been pretty hot here, but no chance of cooling down any time soon. Hope you're cooling down a bit. Happy WW! Whew, I do NOT blame you! My first was born in August and I thought I was going to die. Hang in there! Oh, that's a picture of a 4 letter word. It IS hot here, but I don't want the other extreme either. What happened to Spring and Fall? I'd just be happy if we had one of those seasons. That is beautiful! I live South Texas so we don't see snow around here. Heat wave in upstate NY as well. My parents live in VT, my dad isn't happy at all with the heat and humidity. He's longing for fall and then winter and snow! That does look good right now, doesn't it? Such a pretty picture!! It reminds me of my home in Alaska. Love it! Wow! I haven't seen snow in a while! Wow, I live in Texas so I've never seen a winter like this. That's beautiful! with triple digit tempertures we need some cool thoughts. Beautiful photo! Anything to stay cool. Happy WW! I wish we had that weather here now! I hate this humidity! !